At Southeast Sports & Rehabilitation our goal is to get our patients back to doing the things they love QUICKLY. When patients are no longer experiencing the complaints that initially brought them into our office, we want to ensure that they are going to be better in the long run and decrease their risk of re-injury. One of the ways that we evaluate risk for potential injury is to perform a movement assessment. Athletes in the NFL, MLB, NHL, and NBA, as well as Special Ops military personnel, now spend millions of dollars every year for providers who specialize in movement assessments to keep themselves injury-free. Let me be very clear from the beginning: You DO NOT have to have pain to have a movement problem. This is one of the biggest reasons athletes get hurt. They have no pain, but VERY poor movement skills. 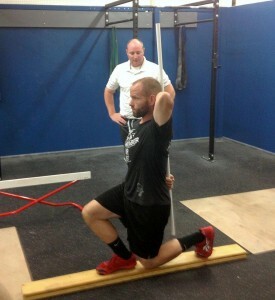 Each test will assess strength, mobility and symmetry. Each movement is scored on a scale of 0-3 with a total possible score of 21. A score of 0 is given if pain occurs during movement, a score of 1 is given if the movement is performed poorly, a score of 2 is given if the movement is performed properly with modification and a score of 3 is given if the movement is done to perfection. PAY ATTENTION HERE: Scoring a 14 or below has been shown to increase risk of injury 51%. Using a movement assessment prior to starting a sports season or exercise routine can help determine potential problems that are often overlooked by other doctors or therapist that DON’T use this useful tool. If the weaknesses uncovered by the movement assessment can be identified and addressed, decreased injury risk and improved performance should follow naturally. Once we’ve identified the issues, we can recommend corrective exercises during your office visit that can done at home or in the gym. These exercises are a necessary component in the resolution of the problem, but they won’t correct any underlying structural issues—combining these “homework” exercises with regular care in our office is the best way to get you prepared to perform at your best. Want more information? Give us a call or request an appointment with one of our sports docs…consultations are always FREE!